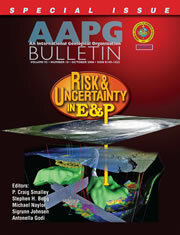 The full article as published (2.2mb) in the October 2008 AAPG Special Edition Issue "Risk & Uncertainty in E & P"
Download a pdf of the PowerPoint slide deck (6.4mb). Portfolio optimization processes help managers understand the costs of achieving performance goals and the trade-offs in the performance of one businessmeasure versus other business performance measures. A good portfolio optimization process makes it possible to negotiate goals and constraints on important key performance measures interactively and collaboratively, at the same time being fully aware of the price being paid to achieve one goal at the expense other goals. This article advocates a gradient search process, instead of a traditional linear programming or mixed integer linear programming methods to build thousands of optimum portfolios from an inventory of investment opportunities. The performance levels of those portfolios are then analyzed interactively with a visualization tool to negotiate collaboratively the trade-offs between goals and resource levels for the corporation or business unit.